Now that we have the tools and equipment and spare parts needed to maintain our race car, we need shop space to do the work. Nobody ever has enough shop space. How much shop space is needed? The first consideration is obvious: enough room to move around the car. The task with the largest footprint is alignment. Regardless of alignment method, count on the car “growing” in all directions. 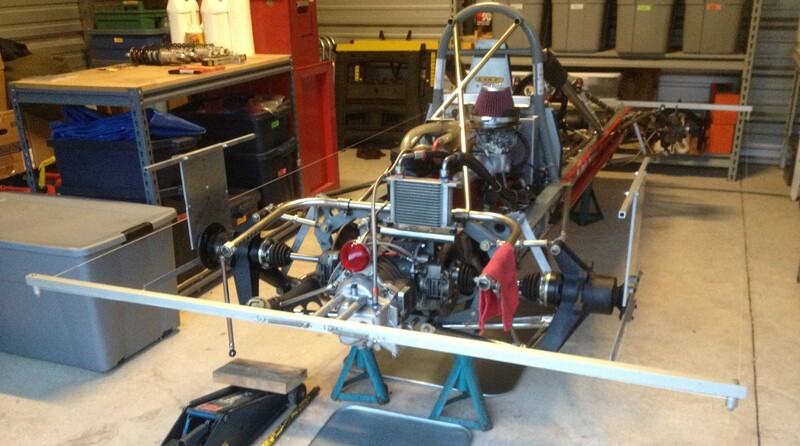 Engine changes require extra space, too, but only at the back of a rear engine Formula Ford. The second consideration is where to put all the stuff. Stuff in this context includes more than just tools, equipment, and spare parts. When a race car comes into a shop, it just kind of explodes. Tires and body parts come off at a minimum. Depending on what maintenance is being performed, there must be places for suspension links, uprights, axles, brake rotors and calipers, the seat, etc. And if the engine is coming out there are oil lines, an oil cooler, an oil tank, water hoses, a header tank, engine mounts, and so on to keep track of. The third consideration are workbenches. A sturdy 6-foot workbench with a vise is a minimum requirement. If homes are needed for a drill press and bench grinder, one workbench will not be enough. Hang as much stuff up on the walls as possible. Peg board is great for that. Wall mounted shelves and cabinets are good, too. Store spare parts in stackable totes. Put them on stock racks and/or slide them under workbenches. Utilize a big plastic tub to store parts (cleaned and labeled) during major maintenance projects like engine changes. One last thought on shop space: there is never enough lighting. Hang more lights than you think you will need…tired eyes late at night will thank you. This is the fourth in a series of blogs on how to get started in racing. If you missed the first three, here are the links: How to Get Started in Racing, Tools and Equipment, and Spare Parts. Race cars wear things out (if you are paying attention) and break them (if you are not) so spare parts are always needed. How many spare parts to carry? How to organize spare parts? Money is obviously the primary consideration (and limiting factor) but there are others. Sourcing is at the top of the list of other considerations. In the digital age, there is so much that can arrive the next day at the click of a mouse. The next other consideration is storage. If there is no room for it on the trailer and it can be delivered tomorrow, why have it at the shop? What is left are hundreds of small, relatively low cost parts to have at the shop and then take to the race track. It would make no sense, for example, to ruin a race weekend over a spark plug so a set of spark plugs goes to the track. Electrical and Fluid Handling. No spark and fuel starvation are the two primary causes of engine problems. This tote contains critical electrical parts (master switch, on/off switch, starter button, coil, starter, etc), a complete set of ignition parts (cap, rotor, condenser, plug wires), and wire in every color and connectors in every size. Also in this tote are critical fuel system components: pump, filter, hose, clamps, and check valve. A complete set of coolant hoses and clamps, oil filter cartridges and o-rings, and assorted light bulbs complete the spare parts in this tote. Chassis and Power Train. Brakes are worked hard in Formula Ford racing. This tote contains spare parts required to refurbish the brake system: master cylinders, caliper seals, caliper pistons, and pads. 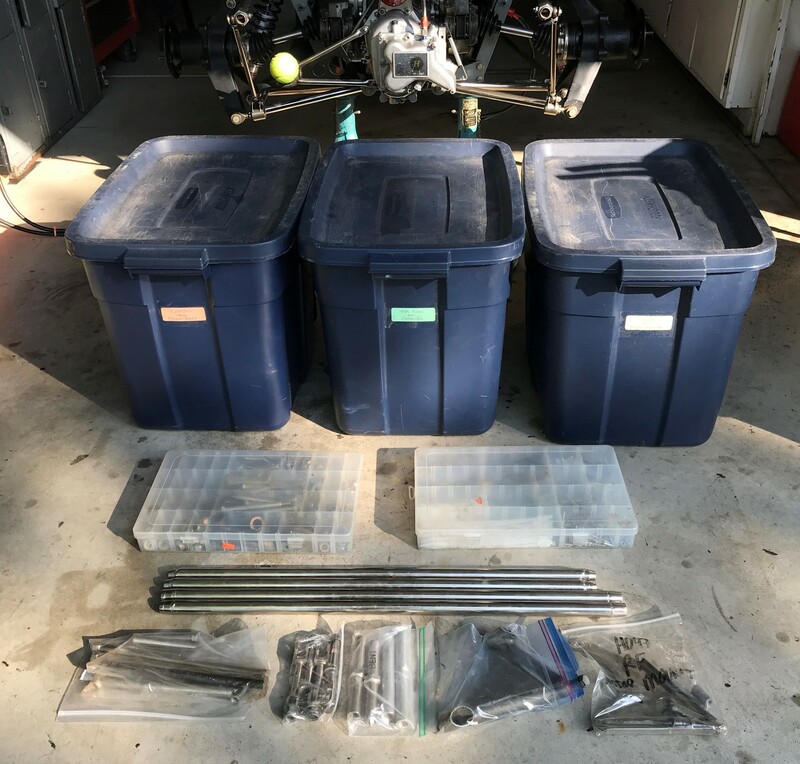 Also in this tote are rod ends in all sizes, clutch parts (disc, slave cylinder, throw out bearing), spark plugs, lobro joints and boots, front wheel bearings and seals, a throttle cable, an assortment of small springs, an engine gasket kit, and alternate gear sets. Vital Fluids and Chemicals. This tote contains the fluids and lubricants (oil, brake fluid, water wetter, bearing grease) and chemicals (cleaners, sealers, thread lockers) required to maintain the car. Also contained in this tote are shop rags, paper towels, micro fiber cloths, emery cloth, scotch brite, etc. This is the third in a series of blogs on how to get started in racing. If you missed the first two, here are the links: How to Get Started in Racing and Tools and Equipment. 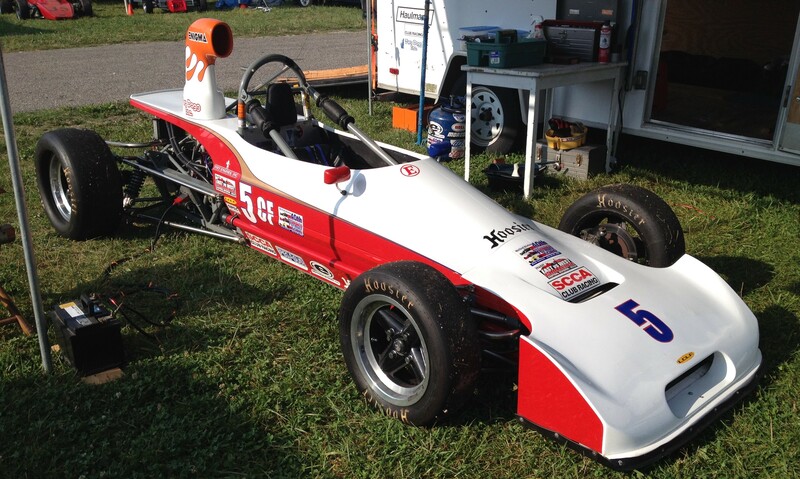 It takes less in the way of tools and equipment to maintain a Formula Ford that you might think. 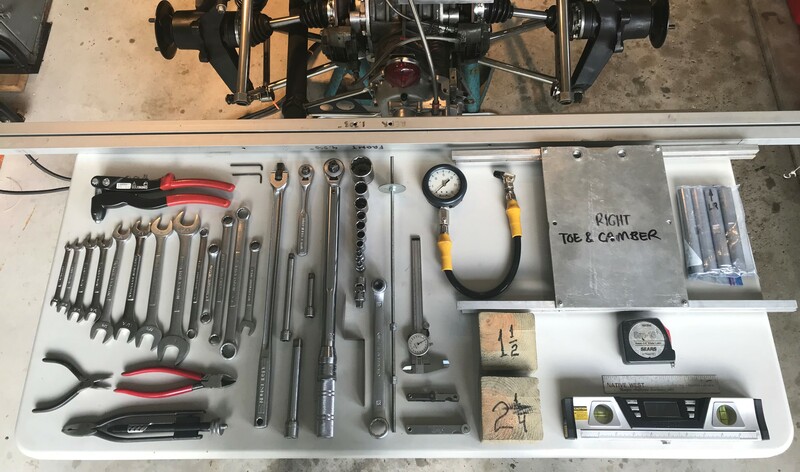 Pictured below are all the hand tools and fixtures that I use to shop prep (checklist, gear change, engine oil change, and alignment) my Lola T-540 for a race weekend. As you can see, they all fit on a folding table! Here is a quick list of the tools and equipment required to perform routine pre-race maintenance on my Formula Ford. Everything I routinely use (except for the alignment fixtures) can be carried in one small toolbox. My Formula Ford was purpose built in 1979 by Lola Cars in the United Kingdom so most of its bolts are English. The exceptions are a few metric nuts on the Hewland Mk9 transaxle (which utilizes a highly modified VW Beetle case). The automotive industry was an early convert to metric. Therefore, production based race cars are likely to have most if not all metric fasteners. If it is a recently designed race car, there are also likely to be a large number of socket head cap screws because of tight clearances. Tools and equipment is the second in a series of blogs on how to get started in racing. Next up: spare parts.